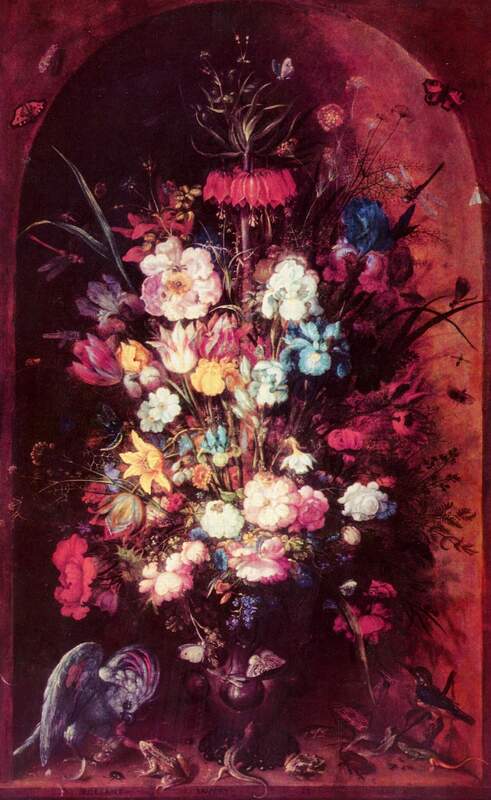 Still life (130x80cm, 1624) the largest painting [Roelandt] ever made, with 44 different species of animals and 63 species of flowers. Roelandt Savery (1576 – buried 25 February 1639), was a friend of Balthasar van der Ast and Ambrosius Bosschaert the Elder. Roelandt Savery bought a house in Utrecht where he joined the Guild of St Luke. The house had a large garden visited by fellow artists. 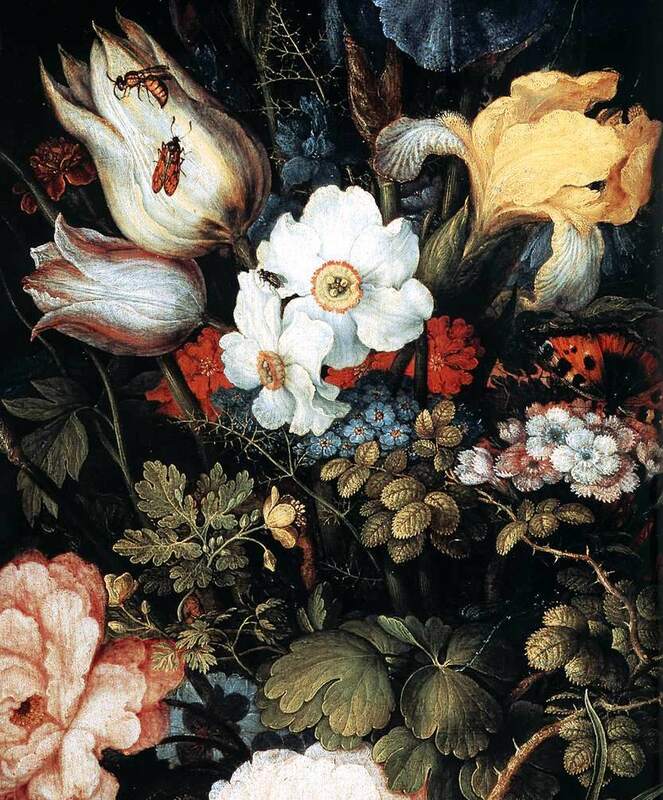 Not only could fellow artists observe flowers, many of which were new to the Netherlands, such as tulips, but they could also examine little animals and incorporate them in their still-life paintings. Before moving to Utrecht, Savery had owned a house in Amsterdam that he did not sell and which also had a large garden for artist friends to visit and from which to drew their inspiration. The above painting is Savery’s most famous still life. Given, however, that it represents 44 species of animals and 63 species of flowers (see the caption), it is difficult to call it a still-life. It is brimming with life. As a student, Savery had traveled to Prague around 1604, where he became court painter of the Emperors Rudolf II (1552-1612) and Mathias (1557-1619), who had made their court a center of Mannerist art. Between 1606-1608 he traveled to Tyrol to study plants. Moreover, Savery met Gillis d’Hondecoeter (Antwerp, ca. 1575-1580 – Amsterdam, buried 17 October 1638) and became his student. Gillis d’Hondecoeter painted landscapes, trees, fowl and birds. Savery also studied under Gillis van Conninxloo (1544 – 1607) a landscape artist. Therefore, although Roelandt Savery painted a number of still-life paintings resembling the still-lives of Balthasar van der Ast, he was interested in both flora and fauna and, particularly, in the dodo. 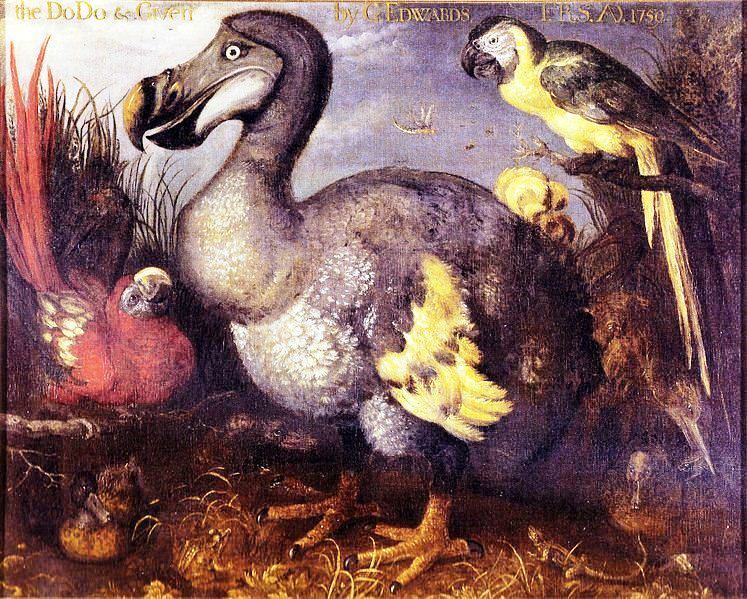 Gillis d’Hondecoeter had painted the now extinct dodo, a former inhabitant of the island of Mauritius, and so would Savery and his student and nephew Jan Savery (1589, Haarlem – bur. 7 August 1654, Utrecht). 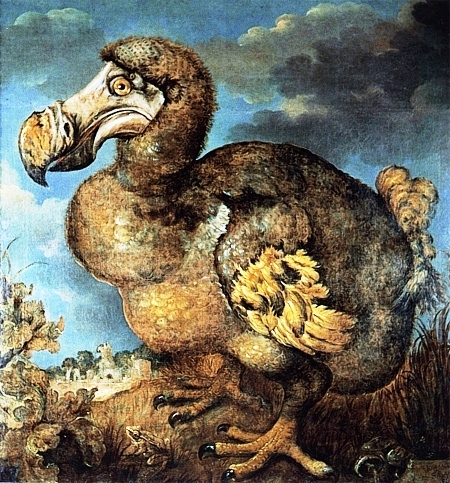 One of the most famous paintings of a dodo, from 1626. 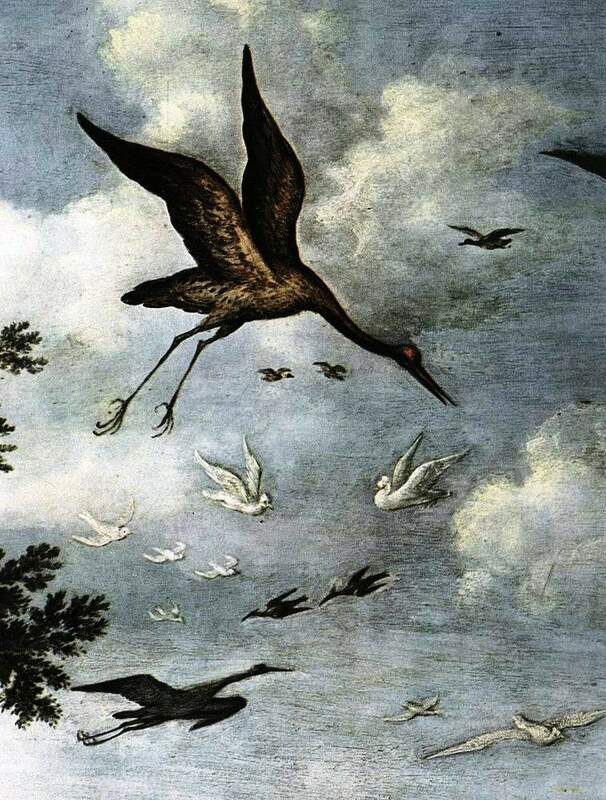 The image [by Roelandt Savery] came into the possession of the ornithologist George Edwards, who later gave it to the British Museum. Savery’s style is associated with Mannerism. 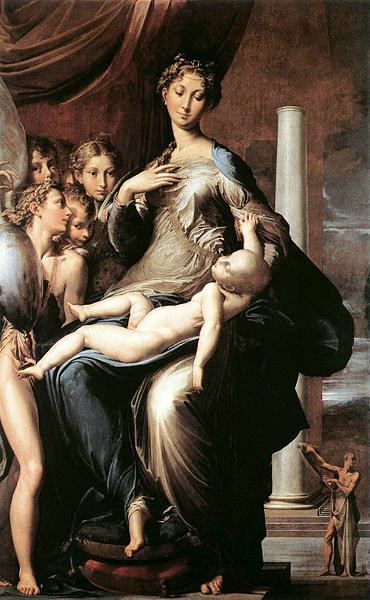 As mentioned above the court Emperors Rudolf II and Mathias were centers of Mannerist art. Mannerists paint figures with elongated and at times distorted limbs. Their paintings are very busy and meticulous. The movement was a reaction against the harmonious realism of High Renaissance artists: Leonardo da Vinci (April 15, 1452 – May 2, 1519, Michelangelo (6 March 1475 – 18 February 1564) and Raphael (April 6 or March 28, 1483 – April 6, 1520). Yet, Michelangelo was an early Mannerist. Roelandt Savery went bankrupt in 1638, because of heavy drinking, and died a few months later. 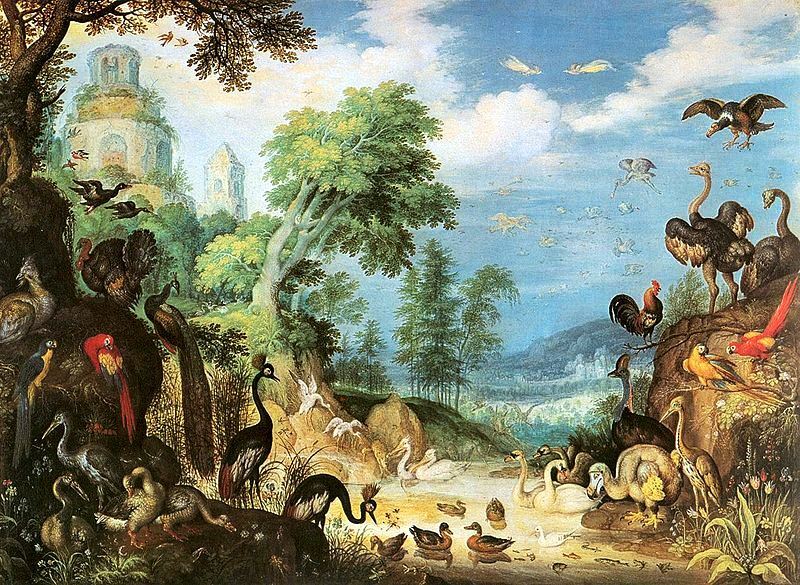 He was a still-life painter, but he also painted landscapes, trees, fowl, animals and, among animals, the dodo. So his legacy is immense and varied. We will therefore look at paintings by members of the Bosschaert “dynasty,” by Jan Davidszoon de Heem, by artists who also studied under Balthasar van der Ast, and still-life paintings by other more traditional Dutch Masters. Yet, Savery’s still-life painting, featured at the beginning of this post, is an epiphany and the model for many, albeit less abundant, still-lives of his age. “Mannerism”. Encyclopædia Britannica. Encyclopædia Britannica Online. Encyclopædia Britannica Inc., 2012. Web. 30 Nov. 2012 <http://www.britannica.com/EBchecked/topic/362538/Mannerism>. “Dodo”. Encyclopædia Britannica. Encyclopædia Britannica Online.